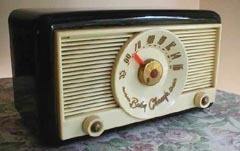 Northern Electric model 5104 "Baby Champ"
Five-tube ("AA5") bakelite with hammer-tone enamel, AM band only, 10 5/8" wide by 6 1/4" high by 6" deep. This classic Art Deco design is also known as the "Rainbow", although sometimes that curved design is called a waterfall. It came in six colors (see this 1947 ad (for what is probably the model 5110) in the Quebec edition of Readers Digest). 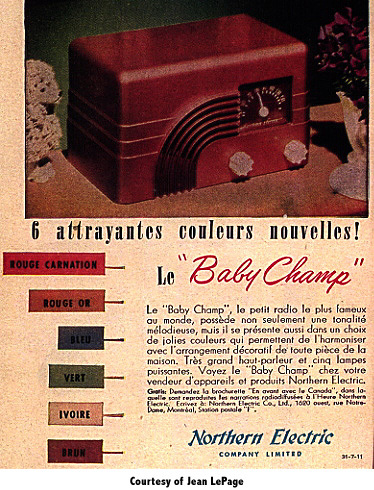 Other models with the Baby Champ name like the 5200 from 1948 looks completely different from the rainbow design. See also the 5400, 5500, and 5700. Less Art Deco, more Jet Age. This was an eBay purchase that turned out to be in much better condition than expected. It was described as not working, and that there may be a small crack on the back of the right side. When I got it unwrapped, the suspicious clunking sound turned out to be a 12SA7GT pentagrid converter tube rolling around. I re-inserted it, and it worked pretty well, no excessive hum or anything, but it seems a bit weak when it comes to pulling in stations. It's a typical AA5 circuit, so it should not be too hard to tweak. The "crack" turned out to be a thin scratch in the paint, which appears to be the factory original hammertone brown. I'm going to leave the paint on, and I have the notion that I can touch up the chips and scratches by making up some acrylic paint to match and stipple it on very carefully with a fine watercolour brush. I think it will have to be two slightly different shades of the same colour, in order to simulate the hammertone effect. I've seen several variations with the Rainbow cabinet. The model 5000 has a different dial, with a pointer that looks somewhat like a propellor. 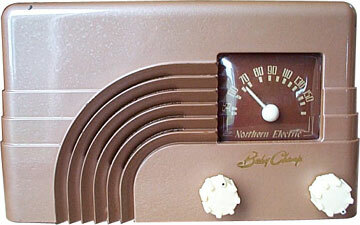 There is a 5110 "Deluxe" Rainbow model, with a third knob in the centre, for tone control. Another three-knobbed model has a BC/SW band switch. I still have to research the significance of the 5104 number. The 4 may simply refer to the colour. The right (tuning) knob is a cracked where it goes on the tuning shaft. Fortunately, it doesn't have to exert much torque, but I've temporarily reinforced it with nylon strapping tape. When I get around to working on it, I want to wrap it with several turns of something. Maybe thin wire or polyester thread, but really I'm hoping to scavenge some Kevlar fibers from a fiberoptic cable sheath, and hold them in place with a bit of epoxy.